Mark Cavendish, David Millar, Geraint Thomas and Chris Boardman were among the stars of cycling who attended the second annual Champions of Cyclesport dinner, held in aid of charity Action Medical Research last Thursday, November 10, at Porchester Hall, London. Also present were Dani King, Graeme Obree, David Brailsford, John Herety and Ben Swift. 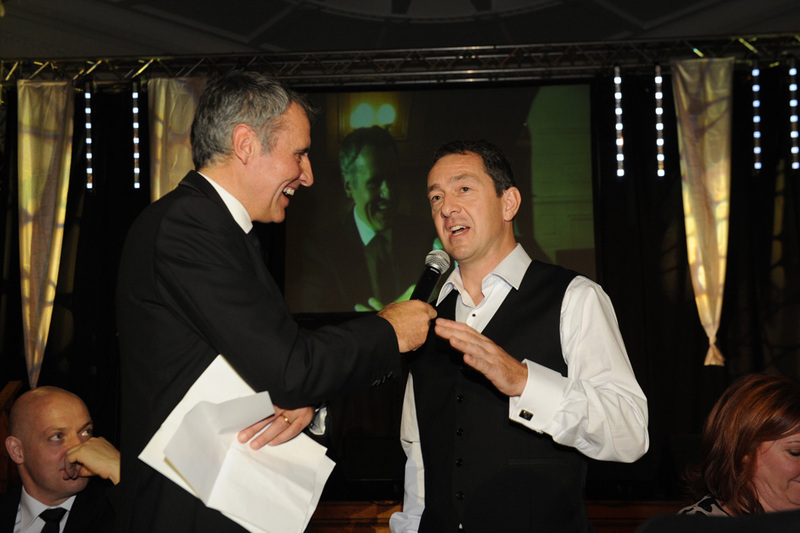 The evening was compered by television newsreader Dermot Murnaghan, who apparrently likes a bit of cycling himself having completed the AMR end-to-end ride this year. The cycling stars helped to riase over £100,000 on the night, money which goes towards helping ill children through medical research. A fair chunk of the money was riased via a charity auction. One item – a day’s ride with Chris Boardman – caused a stir when both Cavendish and Thomas were among the 20 or so winning bidders. “I really enjoyed the first Champions of CycleSport Dinner but this year was even better,” said Thomas, who is cycling ambassador for AMR. Cavendish also put in a successful bid for a guitar signed by Stereophonics bass player Richard Jones. Cavendish said he would present the autographed instrument to guitar aficionado and 2012 Sky team-mate Bradley Wiggins.